When we moved into our house, I was 6 months pregnant with Gabe. Needless to say, there was a lot to get ready for by the time the baby came and the nursery was the last thing on my mind. 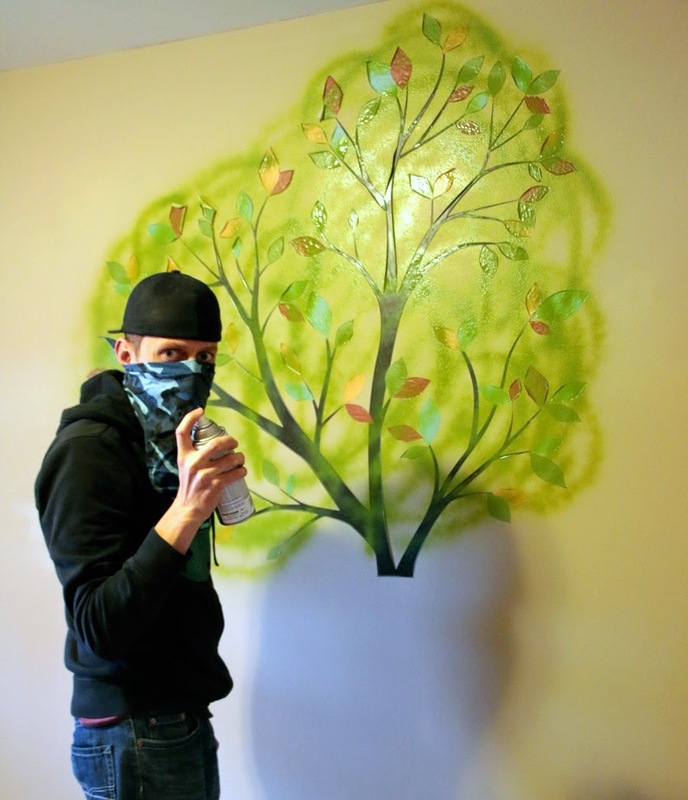 I bought a tree wall decal from etsy.com and that did the trick. But honestly, that's all that we did. 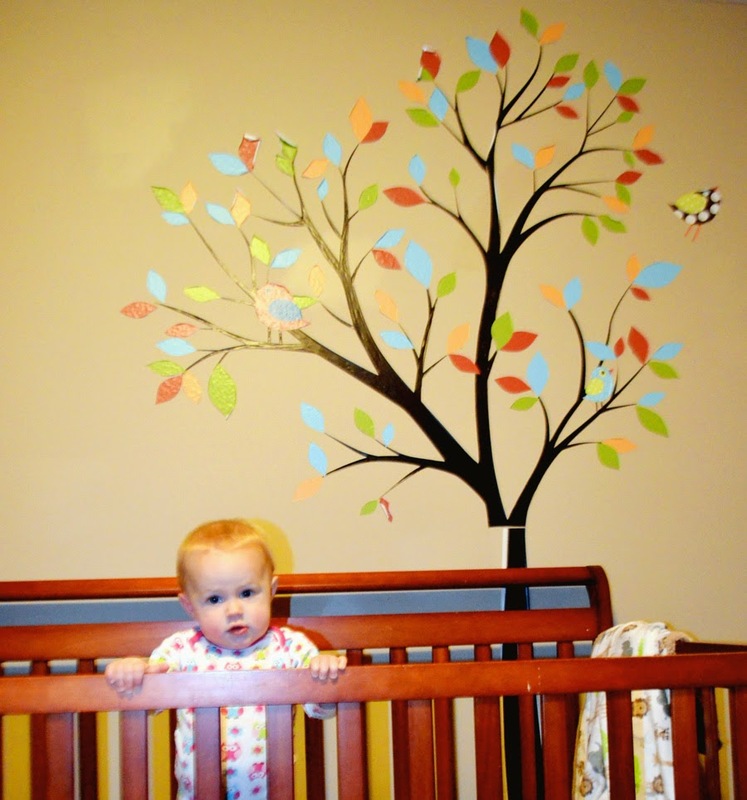 Now, both Gabe and Savina have lived in the nursery and the wall decal has seen its better days. I find myself 6 months pregnant again and finally saying, "alright, time to decorate the nursery!" 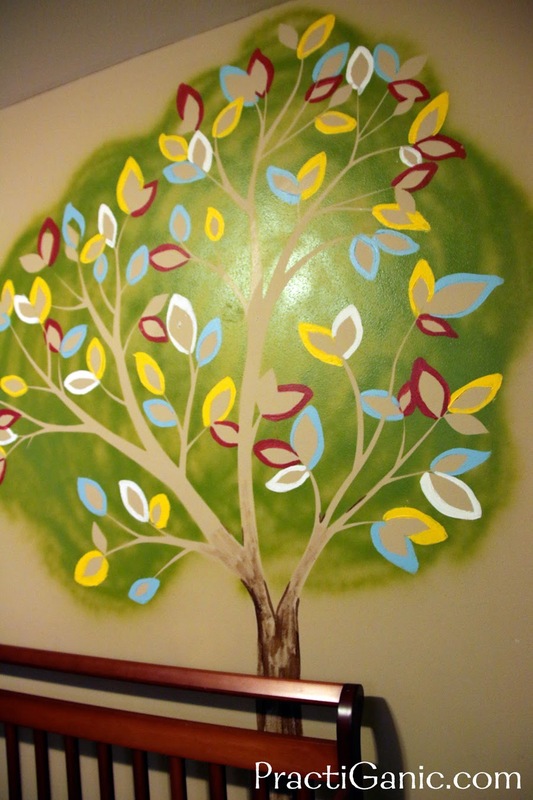 I still really like the look of the tree decal, it's just peeling off the wall and pieces are missing. Why scrap the entire room? Let's just get a second life out of decal! We decided to paint around the decal, then remove it, leaving the look of the tree but a brand new one ... one that won't peel off! Paint - I hardly used any so I just got sample colors from the paint store. We did buy green spray paint too. $12, would've been less if I would've bought less colors! First, we waited for a nice day so we could put a fan in the window to clear the fumes out. Once we moved the crib out of the way, Paul went to work. We first spray painted leaves on the tree to brighten it up a little more than it was before. Once the smell of the spray paint went away, I was cleared to go in. I painted around the leaves to add some color. I thought about changing the colors up from what they were before but I liked the rest of the decor in the room so I thought why waste the money on new stuff! Once it was all dry, I peeled the old decal off and touched up any leaves that needed a little more love. Wa-La! This 'decal' is not going anywhere kids, no matter how much you want to pull on it!